Though he spent years on TV, Mr. Booth said he was more comfortable writing. 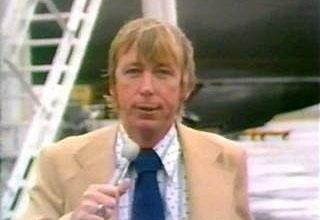 Boston Magazine once called WCVB’s Clark Booth “the most literate man in the field,” and though the accolade was for 1981’s best TV sportscaster, he could easily have vied for MVP honors outside of sports journalism — and beyond broadcasting, too. He wrote columns for print publications during most of his on-air tenure, and kept doing so after setting aside his microphone for the last time. Not for him the sports clichés that were as dull and worn as last year’s cleats. Mr. Booth might quote the novelist Henry James while colleagues made do with baseball statistician Bill James. Mr. Booth, who widely roamed Boston’s sports, news, and features landscapes for 55 years, died Friday in his New Smyrna Beach, Fla., home of idiopathic pulmonary fibrosis, a lung disease. He was 79 and had lived in Reading for 30 years before retiring to Florida in 1999 with his wife, Anne. He covered Super Bowls and Stanley Cup playoffs, the elections of presidents and the selections of popes. One assignment took him to Normandy, France, for the 40th anniversary of the D-Day invasion. His other topics included the fall of the Iron Curtain and the Troubles in Northern Ireland. Mr. Booth spent a decade with WBZ-TV, Channel 4, from the mid-1960s to the mid-’70s, but was best known for his subsequent 25 years at WCVB-TV, Channel 5, where he became the station’s first special correspondent. He began the newspaper part of his career at The Patriot Ledger in Quincy, and later wrote decades of columns for the Pilot and the Dorchester Reporter, filing a final dispatch for the beginning of this year. Yet wide as Mr. Booth ranged geographically and intellectually as a broadcaster and writer, one topic held little interest: himself. Most obituaries of Mr. Booth, including this one, feature a blurry screenshot from his TV days or no photo at all. That’s the way it always was for a broadcaster who “eschews the show business element to TV news so much that he has never allowed his station or this newspaper to take a publicity photograph,” Globe sports TV columnist Jack Craig noted in 1975. Though Mr. Booth reported from the World Series a dozen years, and covered three Super Bowls, hockey was his favorite sport, and he was there for 20 Stanley Cup playoffs. “I liked working with Clark. He was very inquisitive and I could really have an in-depth conversation with him,” said Harry Sinden, a former Boston Bruins coach, general manager, and president. One of five siblings, Clark Vincent Booth was a son of Russell Booth and the former Trudie Elmore, and was born in Boston at the end of the Great Depression. “They were hardscrabble times, yet remarkably inspirational,” he recalled in an obituary he prepared himself. As he grew up, he lived in Boston, Arlington, Norwell, and Weymouth, where he graduated from high school in 1956. At the College of the Holy Cross, from which he received a bachelor’s degree in 1961, he majored in English and minored in history and philosophy — “not exactly a formation many might deem practical, but ideal for a budding journalist back then,” he wrote. After basic training in the Army, which he served in the reserves for six years, he began working at the Patriot Ledger in 1962 and jumped to WBZ three years later. He joined WCVB in 1975. In his TV years, he moderated “In Good Faith,” a weekly public affairs program that wove together religion and current events. He also was chief writer for a Boston College TV documentary team that produced shows about conflict resolution in places such as South Africa, the Balkans, and the Soviet Union. In 1963, he met Anne Marion Cowlin, a nurse, “on an enchanted evening,” he wrote, and the rest was “sweet destiny.” They married in 1966. A service will be announced for Mr. Booth, who in addition to his wife leaves two sons, Scott of New York City and Matthew of Lithia, Fla.; a daughter, Tracy Husbands of New Smyrna Beach, Fla.; three sisters, Jacquelyn Splaine of Manchester-by-the-Sea, Roberta Fuller of Centerville, and Cheryl Kirkman of Boston; and five grandchildren. Mr. Booth tailored his respected writing to the medium at hand. Some sentences were best read in print, others better spoken on air. Neither was by nature better than the other. Though he spent 35 years in front of cameras for WBZ and WCVB, Mr. Booth was more comfortable behind the pen, and if anything seemed wary of TV’s unblinking eye.